The double row cup wheel is the most popular cup wheel configuration on the market today and is found on job sites, supply houses, and rental yards across the world. The double row design provides a smoother finish, more surface coverage, and more aggressive grinding versus the standard single row configuration. By having two rows of segments, the Double Row design provides a more stable grinding platform and prevents the "gouging" often seen in the single row variation. Our one piece molded body helps eliminate the uneven wear commonly associated with welded cup wheels, resulting in a smoother initial grind and less user fatigue. 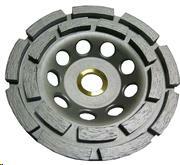 All Lackmond cup wheels employ wrench flats for easy removal once the job is finished. * Please call us with any questions about our wheel diamond cup 7 inch double row rentals in Aberdeen OH, Maysville KY, Manchester, Georgetown, West Union and the Cincinnati Metro Area.